Meet your Board Chairman – Robert Overton, Jr. 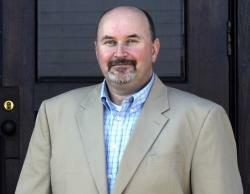 Rob currently serves as the Executive Director of the University of West Florida Historic Trust. In his position, he oversees all aspects of the organization’s operation of twenty-nine historic properties including twelve museum facilities in downtown Pensacola, Fla., and a 40-acre archeological site with a historic farmhouse and Visitors’ Center in Milton, FL. Both sites feature indoor and outdoor exhibits focusing on art and history. In his 15-year tenure with the museum, Robert has served as Museum Curator, Chief Operating Officer and currently as Executive Director. Overton has served on the Visit Pensacola Board of Directors since 2016. On the board, he has served on the grant committee since its inception in 2016 and served as committee chair in 2018. Outside of Visit Pensacola, he is a member of the American Alliance of Museums, the Florida Trust for Historic Preservation, the Southeastern Museums Conference, the American Association of State and Local History and he serves on the Board of Trustees for Florida Association of Museums. Overton has a bachelor&apos;s degree from the University of West Alabama and a master&apos;s degree from the University of South Alabama, both in history. He and his wife Angela have two children and three grandchildren.